The average income for workers who are free-lance or self-employed fell from 2003 to 2013. The findings raise questions about the future of the gig economy if we don’t renegotiate the social contract. EDITOR’S NOTE: The nature of work in the U.S. may be changing from traditional employment to the “gig economy” – where people are self-employed, work as contracted labor, hire out through a temp agency, or freelance. We asked Roberto Gallardo, Ph.D., to take a look at how this trend might be playing out in rural America. This is the third part of Gallardo’s investigation. The first installment showed that the gig economy expanded in metro areas from 2003-2013, but it declined slightly in small cities and rural counties. Last week we looked at the relative number of jobs in various sectors of the “gig economy.” Today, Gallardo looks at income levels. While the number of people working in the “gig economy” in certain industries may be expanding, the average income these people take home is not. Income for “gig economy” jobs declined in every industry from 2003 to 2013 for the nation and metropolitan counties. Only one industry saw gains in income in nonmetropolitan counties: transportation and warehousing. The highest average income of these nonemployer establishments in the nation and in metropolitan counties was real estate. That sector had incomes of $96,874 nationally and $100,070 in metro areas in 2013. 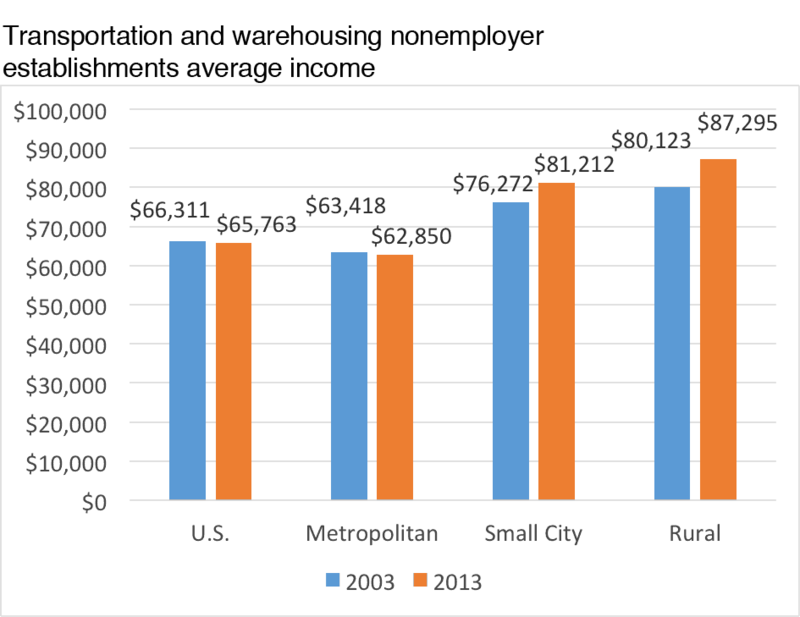 The highest average income in small-city counties (or micropolitan) and rural (or noncore) counties was in transportation and warehousing. That sector had incomes of $81,212 and $87,295 respectively in 2013. My guess would be we are seeing the “pie effect.” After job losses of the Great Recession, more people turned to the gig economy. While the number of people attempting to earn livelihoods in the gig economy grew, the total income available in the gig economy didn’t necessarily expand. It’s as if more people are trying to eat the same pie. There’s less pie for each individual. For example, Airbnb would fall under accommodation and food services. 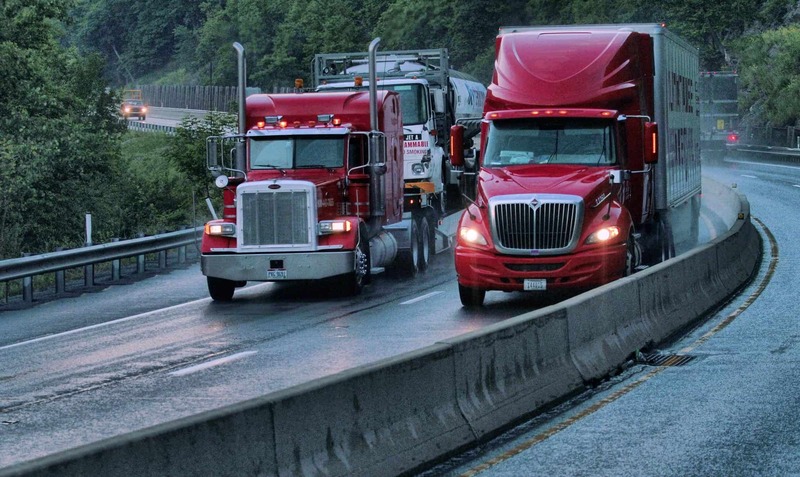 Average income for this industry declined 42 percent in the U.S. between 2003 and 2013; 43.6 percent in metropolitan counties; 32.2 percent in small-city counties; and 23.6 percent in rural counties. Perhaps as more and more people marketed their houses and rooms for rent, demand for the rooms remained more or less the same. So there are more people eating from the same pie. This pie analogy helps explain the transportation and warehousing industry trend in small-city counties and rural counties as well. The ratio of nonemployer establishments per 1,000 residents in this industry declined (as we saw in part 2) but average income increased between 2003 and 2013. In other words, fewer people were eating from the pie, so the slices got larger. We’re not likely to see an overall drop in the number of people attempting to earn through the gig economy. The gig economy is as vibrant in rural counties as it is in metropolitan counties. In fact, a higher share of rural residents may be depending on the gig economy compared to metropolitan residents. So for incomes to start increasing, we’d need bigger pies. The gig economy isn’t the only part of the economy that struggled in recent years. Median household income (another measurement of economic health) has been stagnant or declining, as well. The income drop may be part of a larger trend affecting the economy as a whole. So what does this mean for the future? The question isn’t whether the gig economy is an important part of both rural and metropolitan economies. Clearly, the gig economy is vibrant regardless of county type. The question is how we expand these industries enough to make the pie bigger so those relying primarily on gigs can make a decent living. A couple of recommendations regarding rural communities come to mind. First, increase educational and technical assistance efforts in rural communities on how residents can participate in the gig economy, both as entrepreneurs to gain income and as consumers to benefit from access to a larger marketplace. Likewise, the technical ability and skills to “telework” are critical if the gig economy is to expand in rural counties. Second, upgrading broadband infrastructure in rural communities should be a priority. Broadband is the backbone of the gig economy. Not having adequate infrastructure places rural entrepreneurs at a disadvantage. They can’t participate at the same level as metropolitan residents. Lack of broadband also limits consumer choice in rural areas, because they don’t have the same access to online marketplaces. But the biggest takeaway from studying the rural gig economy, however, is that the way America works is changing. Gig workers get income, but they are largely on their own when it comes to benefits tied to traditional jobs such as retirement and unemployment insurance. If working gigs is going to be a good choice for any Americans – not just those living in rural areas – we need serious conversations about the current social contract regarding employment. Roberto Gallardo, Ph.D., is the leader of the Mississippi State University Extension Service Intelligent Community Institute. The institute helps rural communities transition to, plan for, and prosper in the digital age. Gallardo is also a senior fellow at the Center for Rural Strategies, which publishes the Daily Yonder. How this story defines rural. For our definition of “rural” we are using the Metropolitan Statistical Areas system, which divides counties into three groups: 1) Metropolitan counties (cities or urban) – a county that (a) has a city of 50,000 residents or more or (b) is adjacent to and has strong economic ties to such a county. 2) Micropolitan (or small cities) – nonmetro counties that (a) have a city of 10,000 but less than 50,000 or (b) are adjacent to and have strong economic ties to such a county, and 3) “noncore” or rural – counties that are (a) not part of a metropolitan or micropolitan area and (b) have has no city larger than 9,999 residents. Left: Agriculture nonemployer establishments had a higher income in rural counties compared to small city counties and metropolitan counties. However, income fell between 2003 and 2013 across the U.S. and all county types. Right: Average income in the construction nonemployer establishments fell for the U.S and all county types between 2003 and 2013. The biggest decrease took place in metropolitan counties, drastically reducing the average income compared to rural counties in 2013. Left: Manufacturing average income also fell between 2003 and 2013; however, the decrease was less in rural counties while the largest was seen in metropolitan counties. Right: Accommodation and food service nonemployer establishment’s average income fell in the U.S and all county types between 2003 and 2013.